This video tutorial series walks you through the development of a predictive analytics solution using Microsoft Cortana Intelligence Suite. The solution is realized as a web application to predict the number of delays with probability of a flight segment between two cities with a particular airline at a particular date and time. The content of this series is based on what is published at http://aka.ms/CortanaManual by and thanks to Todd Kitta. and package it as a web service for consumption. 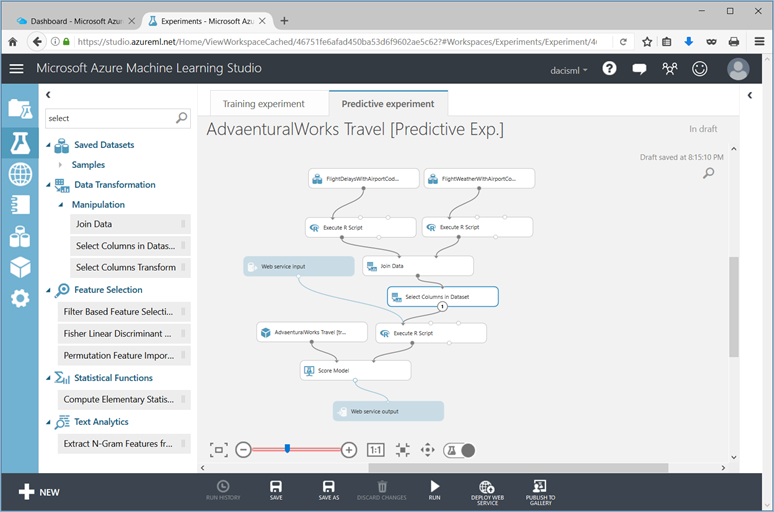 If having not tried Microsoft Azure Machine Learning Studio before, I hope you will enjoy and appreciate the build-in canvas and native drag-and-drop capability for creating and composing a model. It let you explore and realize your creativities in multiple dimensions. There are nine tasks total. Here we go. So, what qualifies the machine as being able to learn? What is learning anyway? Look for my upcoming blog posts to examine the concept of “learning” and more.